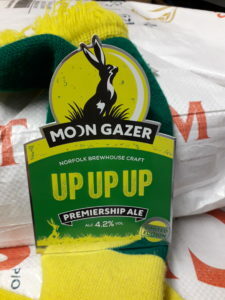 So, since Team Farke and Co. have done such an amazing job this season we thought here at Team Moon Gazer we would brew up a special beer to help beer loving Norwich City fans raise a glass to give them one final push for promotion. We’re not over the line yet but we can’t help that thinking think that one final push from the fans with a pint of Up Up Up in their hands can only help. So, we wanted to brew a beer to bring some cheer and reflect mood that the football club has brought to Norfolk this year. In creating this ‘Premiership Ale’ we wanted to match the right mix of ingredients that Daniel Farke has done with his squad, blending together little touches from across the world – and Norfolk of course – to achieve a winning combination. The starting point had to be Germany, since the manager has been pivotal to the success, as to have his fellow countrymen on the pitch and the training ground. Farke made his name in Dortmund and so we initially turned our eyes to beer style called Dortmunder Lager – which uses Pilsner and Munich malt. This malt would form the basis of our brew. However, it’s an ale which we are after and so to a good dose of German malt we also looked to add more malts which would blend the Dortmunder pale lager style into a light amber ale. We couldn’t forget McClean and so in went some Scottish Oats, while the finishing touch (no pun intended) was some Rye – the staple baking ingredient of Pukki’s home country. Quite fitting that a small addition can make such a big influence! 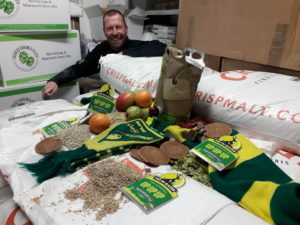 All of the malt was from Crisp Malt, near Fakenham. OK, not quite Dereham but close enough to be a nod to Todd Cantwell who has been key. The hops we also thought should come from Germany to pay tribute to the influence from German contingent of Stierpermann, Zimmermann and others. So, look out for a mix of Tetanng, Perle and Northern Brewer hops giving a good floral and citrus hoppiness. As for the rest, well we decided on a bouquet garni of ingredients to make sure that everyone was represented. All of the ingredients selected featured heavily in either the national cuisine or drinks and so will be familiar to the players they represent but ultimately the beer will be a nice session ale – that’s the beauty of the right mix they just all blend in seamlessly as the boys do on the pitch. So, into the brew goes a magical but gentle sprinkling of ingredients representing; Swiss chocolate, Argentinian oranges, Cuban Mango, Bosnian raspberries, Dutch pears, there was even a Dutch stroop waffle and a slice of Irish Soda Bread. The result is a light amber ale, smooth bitterness but bursting with flavour – a winning combination we like to think. The beer will be in Norfolk pubs from next week and for the last home game on April 27 so do look out for it and sing-a-long with a pint of drinking Up Up Up.